There are lots of free lounge chairs and umbrellas throughout Castaway Cay, so whether you’re an early riser or like to sleep in you shouldn’t have any trouble getting a spot in the shade for your family. You can lounge and sun tan, play in the sand (there are lots of beach toys available for purchase in the Castaway Cay gift shops in case you forget to pack them), and of course splash in the water! You can even see sea life, like a variety of fish and sea turtles sometimes! This is a runDisney event that’s free! When you board your ship, you can register at guest relations for the Castaway Cay 5K. When you do the run, the runners are the first off the boat, then you can enjoy a leisurely run with tropical surroundings, and even get a medal at the end. You can read more about the 5K in my blog about it. You can rent floats individually, or get them as part of the Getaway package that’s only $43 (which includes snorkel rental, bike rental and float rental). We loved lazing around the shallow parts of the bay in the floats! You could even see fish swimming around in the crystal blue waters! Mickey and the gang are always up to something fun on Castaway Cay! There are lots of photo and meet-and-greet opportunities with Mickey and the gang, and sometimes Captain Hook. In the gazebo outside Cookies BBQ, there are often dance parties with Mickey and friends! It sure is fun to grab a soft serve with your little one then get to do a conga line with Goofy! The island has two locations for a family-style BBQ buffet, which is included in the cost of your Disney Cruise. For additional charges, throughout the island you can find souvenir drinks and cups (such as the Sven one I’m posing with after I did the 5K). There are also stands where you can get alcoholic beverages throughout the island, so you don’t have to stray far from wherever you set up on the beach. On the island, there is a Finding Nemo themed water slide that lands right in the ocean! It’s a fun, adventurous way to do a water slide, and it’s fun that in order to get to it you have to swim to it. 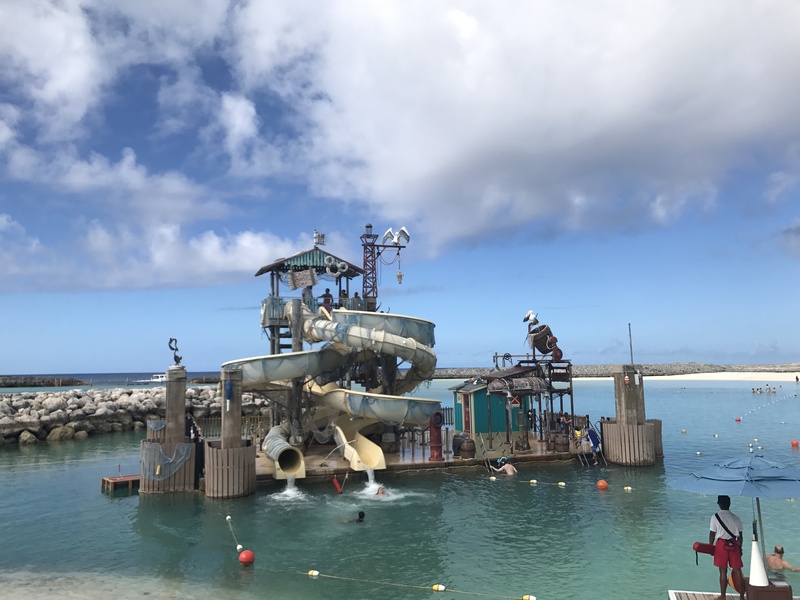 Also on Castaway Cay, there are countless port adventures you can do too, but I wanted to highlight the options my family and I did on Castaway Cay. I would love to hear what your favorite family adventure is on Disney’s private island!